Ontario's Pesticides Act is chiefly concerned with protecting the environment through proper handling, transportation, storage, use, and disposal of agricultural chemicals. These matters are also crucial to protecting the health and safety of individuals who work with pesticides. Successful completion of Ontario's Pesticides Safety Course is a legal requirement for use of many common pest control products. Contact your local Ministry of Agriculture and Food (OMAF) office for more information about the training program. The Pesticides Act is administered by the Ontario Ministry of the Environment (MOE). Following is a brief synopsis of the Act's requirements for safe transportation and storage of pesticides. Never leave pesticides unattended in a parked vehicle, unless the vehicle is locked or parked in an area to which public access is denied. A sign indicating " Chemical Storage Warning-- Authorized Persons Only" must be displayed on unattended parked vehicles containing pesticides. Vehicles transporting more than 500 liters of pesticides must be placarded with a chemical warning sign at all times. Pesticides must be stored in an area that is used exclusively for this purpose. Separation from storage facilities for other commodities must be sufficient to prevent cross-contamination. Pesticides and pesticide adjuvants (e.g. emulsifiers,diluents, spreaders, and dyes) are the only items to be stored in this building, room, or part thereof. If the pesticide storage is later to be used for other purposes, it must first be decontaminated. Insecticides, herbicides and fungicides should be stored separately from each other. The storage area must be screened and ventilated to the outside. 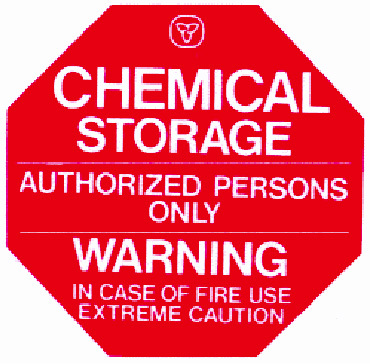 Chemical storage warning placards (available from OMAF and MOE) must be posted on the door(s) of the storage area. The storage area must be lockable to control access. One staff member should be responsible for security. No one should be able to enter the storage area without authorization. There must be no floor drains, unless they flow into a separate holding area which can be pumped out. Such spills must be disposed of in accordance with Regulation 309 of the Environmental Protection Act. Post emergency telephone numbers in a prominent place. This list must include the doctor, poison control centers, fire, police, Spills Action Center, and the MOE's Pesticides Control Officer. Absorbent material (i.e. sawdust, soil, or rags) should be available in sufficient quantity to clean up any spills or leaks from containers. The MOE's Pesticides Safety Handbook describes procedures for equipment decontamination. Pesticides storage areas must be cool and dry to prevent product breakdown or inactivation. Check product labels for winter storage guidelines. Pesticides should be stored in their original, labeled containers. Any new pesticides storage structures should be placed so as to avoid contamination of watercourses in the event of a spill, explosion, or fire. Existing buildings and surrounding terrain should be modified to ensure containment of runoff. Wash-up facilities with adequate supplies of soap and water should be available. The MOE must be notified of any fire or spill where there is an environmental impact. Any fire, spill, or theft of pesticides must be reported to the Spills Action Center. Only trained personnel wearing adequate protective equipment should be involved in any spill cleanup. For more detailed information about safe pesticides storage and handling, contact the nearest Environment Ministry office.